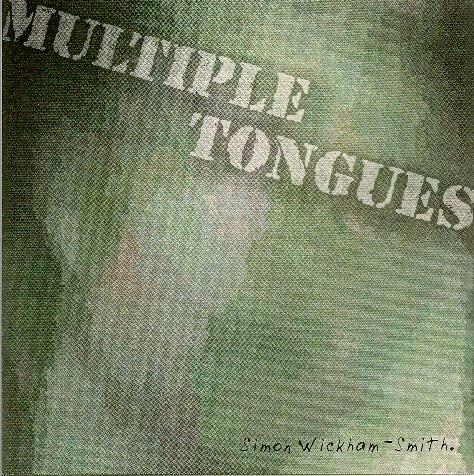 Simon Wickham-Smith - "Multiple Tongues"
The CD begins with the 6 part, 15 minute Just Kidding. The first two parts feature pulsating electronics and warbling sounds. It's not until part 3 that a recognizable human voice appears, mildly efx'd and reciting a narrative. Part 4 includes heavily efx'd voice, and Wickham-Smith's description of the voice being "dissolved" definitely resonates on this one. The voice only seems to appear briefly on part 5 and sounds like a robot. Part 6 is interesting, with a sparse repetitive sound pattern and low key single toned signal, plus heavily efx'd voice that seems to be calling out to someone but the words can't be made out, and I imagined a film where a television goes to a test pattern and a spirit from beyond is broadcasting through the TV. Later in the piece the sounds and voice become harsher and the words only slightly more discernible though I couldn't understand them. Songs and Dreams the Whalers Weave is next and is really just a lot of variable speed with tape experimentation which results in rapid fire chipmunk voices. There are also some tones that are barely perceptible but sufficiently high pitched as to cause mild discomfort (I'm listening through headphones) but it's interesting combined with the chipmunk voices. Voice spoken at normal speed is multi-tracked so that the individual is accompanying himself with the same text. What I've described is more or less representative of the remainder of the works on Multiple Tongues. Reading Wickham-Smith's detailed descriptions of his interest in the voice and what he is trying to accomplish on the album sparked my interest but it grew tiresome throughout it's nearly 70 minute length.